Pit is a very defensive character. He has access to two reflectors – one doubles as a regular A Spam and is a directed spamming projectile that can rack up some serious damage, and the other is possibly the best aerial mobility with a jump distance comparable to 11 jumps (including Wings of Icarus). He can attack like Meta Knight and his D-air is a brilliant move for disrupting up smashes if it is timed correctly. Also, his regular A attack, if chained, can trap opponents. His big disadvantage is found in one of his greatest strengths: the fact that he cannot recover after being hit in the midst of Wings of Icarus and occasional problems with KOing. Blade Slice Pit is unique for having two different AAA comboes. If you press the attack button three times, Pit will do two slashes and start doing a rapid slash attack. If you press it two times and hold the attack button, he will perform a simply three slash combo. + + + + Blade Thrust Thrusts both of his blades forward. This move has good knockback. + + + + Handstand Kicks Does a handstand then kicks two times above him. + + + + Low Slash Swipes a blade while crouching. while dashing while dashing while dashing while dashing Running Slice Slashes forward with two blades. Smash + + + (Smash + ) or (Smash + ) or Blade Slash He slashes with one blade then with the other. This is your best KO move on the ground. Smash + + + (Smash + ) or (Smash + ) or Upper Attack He slahes above him three times. This move is quick but don't expect KOs from it. Smash + + + (Smash + ) or (Smash + ) or Front Back Slash He swings his blades to one side then the other. after grab after grab after grab after grab Angel Knee Pit knees his opponent. after grab after grab after grab after grab Forward Slash Slashes his opponent forwards. after grab after grab after grab after grab Twirl Slam Throws the opponent backwards, slamming him in to the ground. after grab after grab after grab after grab Skyward Kick Does a handstand and kicks his opponent. after grab after grab after grab after grab Ground Slam Slams his opponent into the ground. Aerial Ring Spins his blades in front of him. + + + + Forward Thrust Thrusts his blade forwards. + + + + Backwards Thrust Thrusts his blade backwards. Unsweetspotted, this move is just a little poke but if sweetspotted, it becomes Pit's most powerful KO move. + + + + High Ring Spins his blades above him. + + + + Downwards Slash Slashes below him. This move has high priority and has pretty good knockback. during glide during glide during glide during glide Glide Slash Pit slashes in front of him. + + + + Angel Ring Deflects all attacks if used properly and attacks its foes. Rapidly tap the Special Attack button to keep the attack going. This move can be escaped by good players, and leaves you vulnerable during the cooldown. It also extends your hurtbox, meaning you're putting yourself closer to the opponents attacks. Can also reflect projectiles. + + + + Wings of Icarus Pit utilises his wings to fly. The initial animation has a wind effect, so use it to quickly push away harmful items. Combined with Pit's three jumps, this can create one of the best recovery options in the game. The move's distance decreases if used multiple times in a short time period. + + + + Mirror Shield Deflects projectiles. This move also changes opponents direction like Mario's Cape, so use it on fighters recovering horizontally. He twirls his swords, crosses them above his head, and says, "The fight is on!" + ( or )+ or or He swings his swords around and says, "You're not ready yet!" + He straightens up and spreads his wings. Be careful while using Pit's Up-B, if you are hit while it is active, you cannot use any other jumps and will fall until you hit the ground, or die. His Forward-B can be used as a great edgeguard and deflecting attacks. Spam it, but be careful at your back. 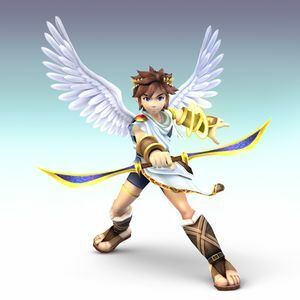 Despite having swords and a bow, Pit is not Link; you must remember that his aerial finishers are somewhat weak, but his Aerial-Back-A is a quick, powerful move that should not be overlooked. Pit has the fastest glide speed of the three gliders. This buffs his recovery even more. Try mixing up your recovery with glides and glide attacks. 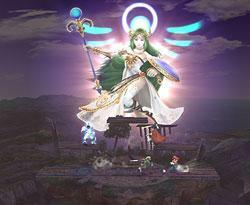 Palutena's Army: Palutena (the Goddess of Light) appears and sends many Centurions from the sky to charge down at the competitors. (The Centurions can be dodged though.) Although some of them can be hit to be defeated, they attack frequently so being hit can be lethal. Something worth mentioning is that Pit is invulnerable while starting the final smash but once the Centurions are out he is not invulnerable, unlike most other characters who are during their entire smash. Marth outranges you in the air and on the ground, so he will be relatively safe from your attacks. He will be trying to space his tipper attacks on you while keeping out of your range. He outspeeds you on the ground so arrow camping will be a little harder. Keep him away from you using your arrows. However, any good player will perfect shield your arrows, so use them wisely. Marth's Dancing Blade outspeeds everything except your basic combo, and you can't really do anything about it. He also has a great pressure game with his attacks. Marth's recovery is fairly linear, so it should be pretty easy to edgeguard, just beware of an occasional Counter. Speaking of which, if a bad Marth is spamming Counter, just grab him. When you're recovering, avoid Wings of Icarus, as Marth can have a very easy time hitting you out of it. Mirror Shield if you can't avoid his attacks. Try to glide your way in smartly and avoid Marth's attacks. Don't try to approach with Angel Ring. He doesn't have deflectable projectiles and you will eat a Forward Smash. KOing him won't be easy, find a gap in his attacks then strike the finishing blow. When you are in KO percentages, watch out for his tipped smashes. These moves have extremely high knockback, and will KO you. In short, Pit has a bad time with Marth. Punish his mistakes and avoid being forced to no recovery. Use arrows wisely and you should win this matchup. Fighting Ike will be a tough one. His standard attacks are strong. Evade his Final Smash because it will KO anything above 50%. He's quite slow however, so spamming arrows shouldn't be too much of a problem while coupled with some hit-and-run speed arials. Link is as tough as Ike. Watch out for his final smash. It's lethal up-close and will KO Pit in one move. Always shoot arrows with the 1 button on the Wii Remote and don't stop firing arrows until his health is at least 125 and then do your smash attack. This Pokémon is a fair matchup for Pit. If Lucario does use his final smash to try and kill you, fly over his reach or even over him to the other side since the beam is slow moving. If he uses his basic Aura Spheres use Down B to deflect it or dodge it, but if he's up close Smash attack him. Also when fighting Lucario be evasive by flying and land far from him then do a quick attack and fly again, once his damage is high smash him off the stage. Be wary of his Force Palm once his damage is high because he can shoot an Aura Sphere and KO you. However, if you deflect it, be careful not to let him dodge the attack and get close to you so he can use force palm. He can use up to three force palms in sucession and due to his high damage % he still might be able to KO you. As a side note, Lucario is a relatively slow character so constant rolling can leave the other player quite annoyed, forcing them into mistakes. Constantly roll through both sides of him and frequently grab for an easy win. Sheik has a great range compared to some other brawlers so flying won't be enough, but a key item fighting Sheik is angling the arrows onto sheik and using the shield. Sheik's Final Smash is easy to dodge as long as you have distance which one jump will dodge it. Kirby shouldnt be hard as a CPU but human controlled can be harder. Even though it will be rare to encounter a good player with Kirby but you will. Pit is the best flyer and Kirby will have to fly too. Most of Kirby's special attacks will be useless leaving him to smash attacks but you can still use ring of angles which is a great advantage. WARNING!!! try to stay in the middle because you are using up your recovery attack leaving you an easy target to fall off. After attacking you will have to fly again. Most good Kirby users will use his up-special and down-special in quite rapid succession, avoid this by simply rolling to the other side of it and grabbing him for his mistake. You need pure skill to defeat Meta Knight as he has all the tactics that Pit has. Make use of your arrows since Meta Knight has no long range attacks. Pierce him with arrows and then slice him to get him back again you'll always win since Pit is a lot faster. This page was last edited on 12 November 2013, at 23:00.